The field of social and emotional learning (SEL), like most fields, has its silos. This, as I see it, is the inevitable and natural consequence of the high level of sustained effort required to make progress on creating useful innovations that solve specific problems, which leads to specialization. SEL, for example, has its teacher well-being silo, its instructional practices silo, and its instructional content/student competence silo. Specialization can become a problem when, for example, complementary ideas are not brought together in ways that might result in a powerful benefit or, even worse, if they are seen as competitive with one another. For example, I see blogs and articles that imply that educators have to choose between focusing on climate or student competencies when in fact, both are critical considerations. In the field of SEL, there are three areas of work that have implications for assessment and program development that complement one another but are often spoken of in isolation. Each of these areas has great promise to support teaching and learning, but there’s even greater promise if they are integrated. I’m going to call the first area “who,” the second, “how,” and the last, “what.” Who is about teacher well-being—the resilience and inner resources teachers need to create positive relationships and a positive classroom climate. How is about instructional practices—what teachers do to provide emotional support, to manage the class, and to provide interesting and effective academic instruction. What is about the student social and emotional competencies that teachers support through formal and informal instruction. Work on “who” focuses on teacher well-being and its relationship to instructional quality. A report from the Robert Wood Johnson Foundation documented that teaching is an extremely stressful profession and that greater teacher wellness is associated with more positive classroom climates, more positive student behavior, and more student engagement in learning. This affects how we might think about assessment and programming. In terms of assessment, a “who” focus might lead us to assess teacher burnout, symptoms of depression, and other indicators of well-being or its absence. In terms of programs, a “who” focus might lead us to focus on working with teachers to support teacher well-being. For example, the team at the CREATE center offer Cultivating Awareness and Resilience in Education (CARE), a professional development program designed to reduce stress, prevent burnout, and support teacher wellness. A rigorous study demonstrated that CARE reduced teacher stress, improved classroom climate, and increased student engagement. The bottom line: When it comes to “who,” assessment and programs focus on teacher wellness. Work on “how” focuses on the quality of teacher instructional practices that affect the emotional climate, teacher-student relationships, and academic instructional quality. This has implications for assessment and programming. In terms of assessment, for example, scholars at the University of Virginia developed the Classroom Assessment Scoring System, an observational assessment designed to measure teacher practices reflecting emotional support of students, classroom organization, and instructional supports, all of which are associated with student academic, social, and emotional learning. Other assessments that are designed to measure climate such as AIR’s conditions for learning survey also largely reflect the “how” dimension of teaching. In terms of programs, work on “how” focuses on supporting teachers to create a positive climate. For example, colleagues at Teachstone support teachers to learn instructional practices that reflect high emotional support, classroom organization, and instructional supports. Similarly, Responsive Classroom is an approach to teaching that emphasizes instructional approaches that create positive community, that reflect effective behavior management, and that involve developmentally responsive teaching of engaging academics. The bottom line: When it comes to “how,” assessment and programs focus on teacher practices. Work on “what” focuses on the social and emotional competencies, including skills and dispositions, that students should know and be able to demonstrate. This likewise has implications for assessment and programming. 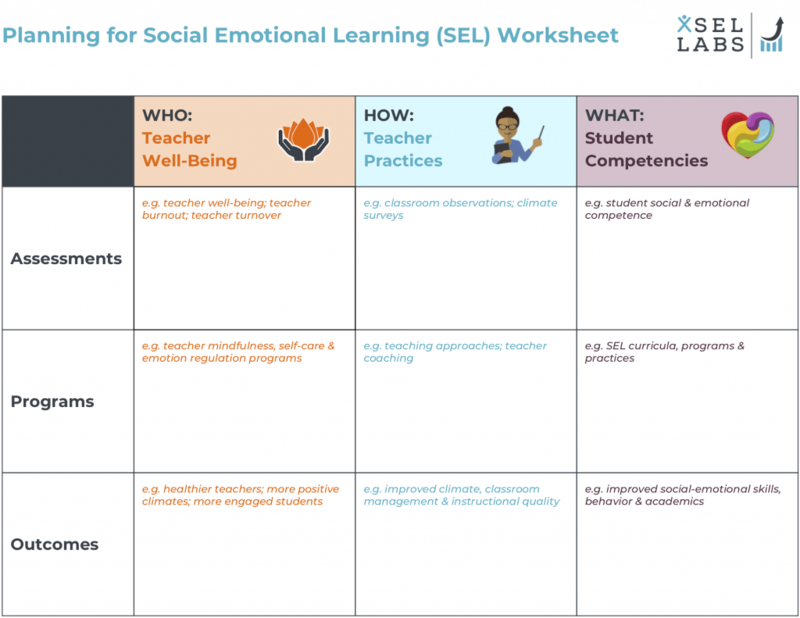 In terms of assessment, for example, xSEL Labs’ direct assessment, SELweb, is designed to measure key social and emotional competencies as defined by the Collaborative for Academic, Social, and Emotional Learning (CASEL) and commonly taught in SEL curricula. In terms of programs, work on “what” focuses on teaching children social and emotional skills. This is reflected most directly in SEL programs, such as those that are included in CASEL’s program guides, and that were the focus of an influential quantitative summary of program evaluations, or meta-analysis. The bottom line: When it comes to “what,” assessment and programs focus on student competencies. What’s more important: Teacher well-being? Teacher instructional practices? Student competencies? It’s a silly question, because obviously, these are all important, and they are deeply interwoven. But the field has developed in such a way that these are usually treated as separate matters to be prioritized and chosen among in a kind of zero-sum calculus that makes no sense. I realize that resources and time are limited. However, I do think it is possible to imagine a setting in which, rather than choosing between who, how, and what, we give equal weight to who, how, and what. What might that look like? 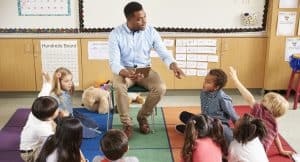 In a setting that prioritized all three, teachers would be provided with support to learn emotion regulation and self-care strategies (who). Teachers would also receive support and coaching on creating a positive emotional climate, developing strong classroom management skills, and providing high-quality academic instruction (how). Teachers would also explicitly teach the student social and emotional competencies that we know are critical for success in school and in life (what). In such a setting, we might reasonably expect high teacher well-being and constructive support for instruction to lead to positive emotional climate and strong instruction. 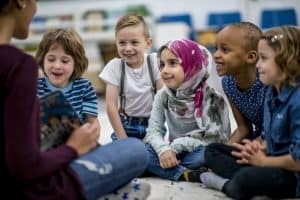 We might further expect that through a combination of a positive and safe climate and explicit skill instruction that students would develop strong social and emotional skills. We might furthermore expect a combination of assessment approaches would help support continuous improvement—teachers might complete well-being surveys (who); the CLASS or student climate surveys might be used to assess instructional practices (how); student SEL competence assessments might be used to assess student development (what). Data in each of these three areas would help educational leaders and classroom teachers focus energy where it was most needed to support healthy teachers, healthy climates, and student social and emotional competence. 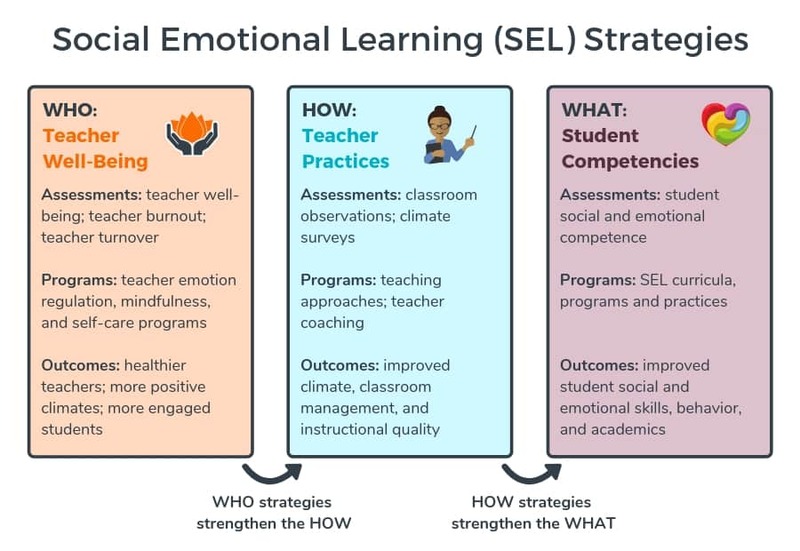 The figure below illustrates how assessment and programs that address the who, the how, and the what of SEL might just yield a result that is greater than the sum of the parts. Now some might say this is not realistic. Perhaps. However, I’d wager that in a district that invests in the who, the how, and the what of SEL, the investment would pay off many times over. Realistic or not, the field has many strands. 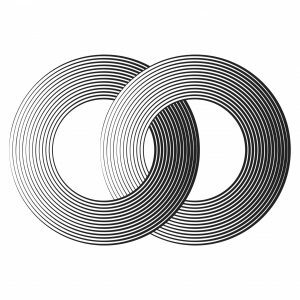 I hope that you agree that these strands do not exist in competition with one another, but rather as complements to one another that could amplify one another’s benefits. I hope, in short, that more people will talk more about how to bring together the who, the how, and the what of SEL rather than evaluating which is most important as if they existed in a zero-sum calculus. After all, what is truer to the spirit of SEL than coming together in common cause? We’ve developed a worksheet to help your team plan for SEL that integrates teacher well-being, teacher practice, and student competencies. We hope you find it helpful as you work together to clarify the assessments and programs your school community will leverage and the outcomes you’ll aim to achieve.